Summary: We have begun a critical phase in the great monetary experiment. We know that we should stop, but our leaders fear the resulting economic shock. They fear to stop, fear to continue. There is a clear model describing this process, but one too disturbing for most people to accept: addiction. The decisions made during coming months might teach us much about America, and perhaps have historic effects. Paul Jackson, Société Générale, 22 October 2013. Click to enlarge. What kind of drug is monetary policy? What model best describes it? (1) What kind of drug is monetary policy? Ed Dolan (economist, bio here) made a typically brilliant insight in the comments to this post. I referred to monetary policy as a “drug”; he replied that it was not a drug — in the sense of illegal drugs (stimulants, intoxicants, hallucinogenics). This forced me to rethink this idea. What kind of drug is monetary stimulus? There are drugs which are both legal and illegal — medicines with risks. Like heroin. As described in previous posts, heroin was the battlefield medic’s most powerful drug — but dangerous if used too long. (2) What model best describes monetary policy? Increasing tolerance, responded by increasing dosage. Discovery that tapering is difficult, even painful. Decision to defer the start until a better time in the near future. Recognition of ill effects from the drug. Renewed resolution to start tapering. Recognition of addiction. Start of a new life, down one path or another. Consider one effect of this, noted by Paul Jackson of Société Générale. The Fed doubled the monetary base (cash plus bank reserves) in six years during the 1930s; the Fed did that in 2008. During the 15 years 1930-1945 the Fed increased the base by a factor of six. During the past five years the Fed has already increased the base by a factor of 4 – it’s growing at aprox 3%/month (40% annualized). This has worked well for us, helping grow US real GDP at 2.2%/year since the start of 2010. With few side-effects, other than contributing to a boom in asset prices (a feature, not a bug, as it enriches the 1%). But if we are in the addiction model these happy days will end. We cannot predict when. The line in the sand marking “addiction” is visible only in hindsight. If the incoming data are broadly consistent with this forecast, the Committee currently anticipates that it would be appropriate to moderate the monthly pace of purchases later this year. And if the subsequent data remain broadly aligned with our current expectations for the economy, we would continue to reduce the pace of purchases in measured steps through the first half of next year, ending purchases around midyear. … the sense of the Committee was that the broad contours of the medium-term economic outlook — including economic growth sufficient to support ongoing gains in the labor market, and inflation moving towards its objective — were close to the views it held in June. But in evaluating whether a modest reduction in the pace of asset purchases would be appropriate at this meeting, however, the Committee concluded that the economic data do not yet provide sufficient confirmation of its baseline outlook to warrant such a reduction. Moreover, the Committee has some concern that the rapid tightening of financial conditions in recent months could have the effect of slowing growth, as I noted earlier, a concern that would be exacerbated if conditions tightened further. Finally, the extent of the effects of restrictive fiscal policies remain unclear, and upcoming fiscal debates may involve additional risks to financial markets and to the broader economy. In light of these uncertainties, the Committee decided to await more evidence that the recovery’s progress will be sustained before adjusting the pace of asset purchases. … In the coming meetings, we’ll be looking to see if the data confirm that basic outlook. If it does, we’ll take a first step at some point — possibly later this year — and then continue so long as the data are consistent with that continued progress. The remaining meetings this year are on October 29-30 and December 17-18. While nobody can reliably predict such things, especially as it depends on unknowable economic data released during the next 7 weeks, most Fed watchers believe the Fed will deferring tapering until the new year. The hoped-for strong growth will cushion the shock (I say “hoped for” since accelerated growth was expected in 2010, then 2011, then 2012, then 2013. It’s now faith, not an analytical forecast). If the growth does not arrive, they will have only delayed the eventual confrontation to a time when we’re many months deeper into the addiction process. The big question: does massive sustained monetary stimulus have ill-effects not yet seen? These illustrate the range of consensus opinion about monetary stimulus. It’s fun, should not stop unnecessary, and more is better. He cannot find any likely possible bad effects from QE, except from some vague (“increased inequality”) and technical (“trading disruptions” ones. He does not even mention any possible side-effects from boosting asset prices (other than “inequality”). Inflation as a possible side-effect is described as “lazy” and “unpersuasive”. So why stop the fun? (b) Why stop the party? From the “Macro Strategy Report” by Jim Reid (Fixed Income Strategist), Deutsche Bank, 23 October 2013 — Red emphasis added. Federal Reserve Chairman Ben Bernanke described the FOMC’s decision not to begin tapering asset purchases at the 18 September meeting as “a close call”. At the time it took most of the market by surprise. In retrospect, it appears a very prescient decision. The fiscal uncertainties escalated into a near fiscal disaster; and what appeared to be “mixed” economic data over the late summer is now emerging as a true -– though perhaps temporary — economic weakening in light of the downtrend in payrolls and home sales. the FOMC may run into a credibility problem (again) by whipsawing the market. The era of easy money is shaping up to keep going into 2014. The Bank of Canada’s dropping of language about the need for future interest-rate increases and today’s decisions by central banks in Norway, Sweden and the Philippines to leave their rates on hold unite them with counterparts in reinforcing rather than retracting loose monetary policy. The Federal Reserve delayed a pullback in asset purchases, while emerging markets from Hungary to Chile cut borrowing costs in the past two months. Normal or not, that’s been the environment now for five years after monetary authorities fought to protect the world economy from deflation and to hasten its recovery. In the advanced world, central banks drove interest rates close to zero and ballooned their balance sheets beyond $20 trillion through repeated rounds of bond purchases, a policy known as quantitative easing. Growing debt is a defining characteristic of this economic cycle for the developed nations as a group. Too see this for other nations go to The Economist’s interactive graphic of total debt/gdp by nation. The US is 7th highest among the world’s major nations. Previous Post America sees the world through a glass, darkly. Let’s drop the shades and see clearly! Next Post Are our film heroes leading us to the future, or signaling despair? I suggest that addiction here is a metaphor, not a model. Metaphors can be useful after the fact, as an aid to understanding a process that is difficult to grasp but which resembles something more familiar. They are not good tools for looking forward. It is unwise to reason or to predict from a metaphor. I gather that there is at present no consensus among experts in the field to endorse any particular model describing the expected response of an economy to quantitative easing. Their guesses seem to cover too wide a range to provide much guidance, either. Economists don’t even appear to agree on what effects QE has already had. Given that, I still think it’s unhelpful, and risks being totally misleading, to try to fit a metaphor to a process the progress and outcome of which are not yet known. Either we have an economic model which we have some good reason to believe reflects the salient characteristics of the actual situation, or we simply do not know what to expect. “Addiction” is not a model in a formal sense, which in current use implies physical or mathematical representation. But it is more than a metaphor. Both models and metaphors can prove to be wrong. They are both descriptions of our current understanding. Either way, the very point of both is to make forecasts. That is the point of the exercise. This is a very common misconception, fueled (I suspect) by the news media’s love of dressing up the often-boring technical aspects of science with controversy. If you can find some who disagree with the consensus — better if they’re willing to make big statements in front of a microphone. There is a clear consensus — both large and deep (metrics of a consensus) about the effects of both US monetary policy to date (of which QE is one component). I cited some relevant papers in previous posts, including two summary articles by the IMF and San Francisco Fed. There is a clear consensus, but smaller, about the future effects of US monetary policy: it is benign, so long as the Fed responds to return of GDP to potential GDP by rapid withdrawal of excess reserves. My point is that this is an experiment, one that has often failed before, operationally complex, with potentially severe consequences of failure. That it is an experiment means uncertainty about the result. Withdrawal pains, as we saw from May – August, are perhaps a foretaste of what is to come. Although economists often have certitude of physicists, economics is not yet physics. As you’ve suggested, Coises, we simply do not know what to expect. But we DO know that QE is NOT growing the economy, it is making the rich even richer as they divert funds we hoped would go into growing the economy into their own pockets. I do not blame the rich for doing what comes naturally to them and am not interested in trying to force them to invest in the economy. They would argue that we are diverting their hard-earned gains into ill-advised ventures that are unlikely to pay off. And they would likely be right because the bottom 60% of society has been financially drained by a wide range of issues. But we do not need to continue QE since we have proof that it does not help the general economy. It makes considerable sense to back off on QE and consider other options. There is more than one way bring an economy back to health. FM correctly calls QE an experiment and as Edison proved in the invention of the light bulb, when you’re experimenting, you continually terminate failed efforts and try new ones. As Einstein pointed out, doing the same thing over and over again and expecting different results is a good definition of insanity. I generally agree with your comment, but believe we can be more specific. It’s more complex than that. QE1 was a big success. But the addiction model says that we build tolerance to QE, and so QE3 appears to have done little. Medium and long Treasury interest rates have risen during QE3 (from the start in September 2012 thru May, when talk of tapering began). That is certainly happening, and something I’d like to write about. But it is probably unconnected with monetary policy. 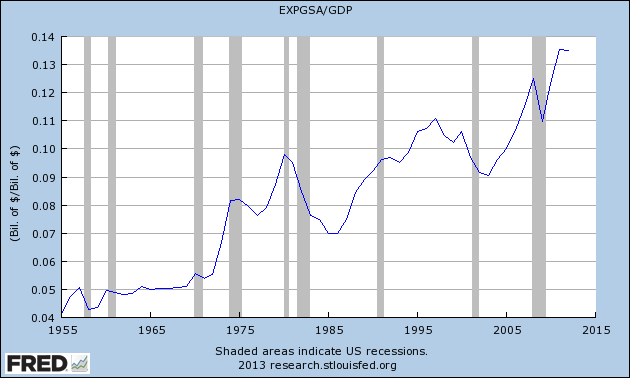 US capital expenditures are falling as % GDP, as more of our national income goes to the 1%. Taxes on the rich near multi-generational lows, wages/gdp falling, profits/gdp at long-term highs, etc. This reduces both consumption (the rich save more than the rest) and long-term growth. The 1% have made the same choice as did the South’s elites after Reconstruction: maximize control at the sacrifice of growth. That is logical per Maslow’s Hierarchy of Needs. Once consumption needs are satiated, then higher needs are sought: relative status and power. Yes. But the asset inflation it appears to drive helps the rich (who own most all US private assets). That’s what their servants on Wall Street see, care about, and advocate policies that do more. People love that story. How flattering to ourselves that even our errors are exceptional — it takes an Einstein to see our mistake. Wrong! This is an insight people from the people of Alcoholics Anonymous (sources here), drawing on their deep experience with dysfunctionality. We always seem to return to addiction. Why is that? In the future I will quote AA as it fits my point even better. My goal was to point out that doing more QE is highly unlikely to improve the economy if it isn’t improving it now. John Hussman has done a lot of research on the effects of QE1 and says that the improvement in the economy from QE1 was seriously overstated. Not sure if he’s right but his argument seems sound on the surface. Absolutely. But that we need advice from AA should be disturbing. Agreed. We are in that part of the heroin cycle, when even increasing is needed to get an effect. Current dosage prevents withdrawal pains, but doesn’t give the hit of QE1. John Hussman is well-worth reading. For those not familiar with him: he was a Professor of Economics at U – MI, now runs the Hussman Funds. Here is his analysis of how the 2008 crash was stabilized — preventing it from spiraling down like 1929-1932. “Did Monetary Policy Cause the Recovery?“, 21 October 2013. I know of no economist or financial expert who agrees with his analysis. Me, neither (fwiw). Given the performance of the funds Mr Hussman manages, agreeing with his analysis would be difficult. But like a broken clock eventually the market and maybe the economy will agree with him. Still an interesting read. I am more inclined to say we have not had a recovery yet. But I think the monetary policy as well as the FASB changes stopped(at least temporarily) the free fall. Whether we ever have what one could call a recovery would likely depend on how much below “normal” one thinks the economy is. Perhaps we did not fall much below “normal” at all. The “Big Picture” graph seems to indicate that our total debt is a bit too high, still. It has not come down much. I think the number in Dr Hunts article in a recent post was that over 260% of GDP the debt acts as a drag on the economy. How do we get from 340% down to 250% in a weak economy? Will defaults, personal and government be the only way? That is just the USA. Are there similar graphs for worldwide debt vs worldwide gross product? Some notes about your comment. No. His economic anaysis could be 100% accurate, and our economic policies imprudent (or perhaps deranged) in terms of their long-term impact. That has nothing to do with his investment performance, which involves riding current trends — irrespective of their long-term social impacts. That’s a misunderstanding. He is predicting the long-term effect of current policies. We cannot tell the result of an experiment until the end. False. Almost every US economic metric has greatly improved from the 2009 trough. The benefits have been unequally distributed, but that does not invalidate the recorvery. That might even be a feature, not a bug, to our ruling elites. US economic policy is to address the debt problem after return to normal growth (i.e., closing the gap between gdp and potential gdp). It’s been closing slowly, so the process is a success (better slow success than never) — so far. The plan will work if we can maintain slow growth. A recession would be horrific here. And the demographic headwinds will only grow more severe over time. See The Economist’s interactive graphic of total debt/gdp by nation. The US is 7th highest among the world’s major nations. I prefer Hyman Minsky. A Ponzi investment is one where the offered scheme cannot in reality yield investors the promised rate of return. To survive and keep the game going the Ponzi operator must raise new funds for distribution to older investors or he must borrow to meet current cash disbursement obligations to his investors. Lehman was exposed in 2008 as a Ponzi entity under Minsky’s definition. Many other large financial institution were about to be revealed to be Ponzi entities too if the Fed had not intervened with first TARP followed by QE 1. QE helps Ponzi operators by herding new investors into the existing Ponzi cohort providing new cash with which to pay off older investors. In addition the lowered interest rates allow Ponzi borrowers to more painlessly meet current cash obligations. Finally, QE supports asset prices which some Ponzi entities are liquidating to meet cash needs. The victims of this Ponzi world supported by QE include honest entrepreneurs who cannot raise funds as long as the putative low risk returns promised by the Ponzi’s are supported by the Fed. The instant this support is withdrawn the Ponzi nature of many investments will be revealed and many banks, funds, insurers, and even governments will founder as their Ponzi reality is revealed. No one suggests things would have gone better for Bernie Maddof if only he had tapered his way out of his Ponzi scheme. It just isn’t a viable route for the Fed to take either. At the first Whiff of trouble the whole scheme will crumble. You go to one of the most visible possible bad effects of prolonged intense monetary stimulus: malinvestments from distortion of interest rates — the price of money. The Minsky cycle should take years to run through, and be a generation or so apart — time for the memory of the lessons learned to fade. Yet many institutions — famously reluctant to discuss asset prices — are starting to point to excesses. Such as the recent IMF report warning about a type of junk loans. But this is quite strange. How can we go through three such cycles in 15 years? This suggests there is a structural problem somewhere. My view is we keep trying to have a full on Minsky Moment and the Fed keeps averting it by ever larger interventions. One possible end game is when that intervention requirement gets so huge even the Fed blanches. On the way to this point the “Too big to fail”, banks will consolidate evermore just like after Lehman. At some point the Fed will have so much non performing junk on its balance sheet purchased at full retail from Ponzi banks and shadow banks that any claim the Fed “Has the backs” of so many very large Ponzi TBTF entities rings hollow and finally the overdue Minsky moment will arrive to stay. 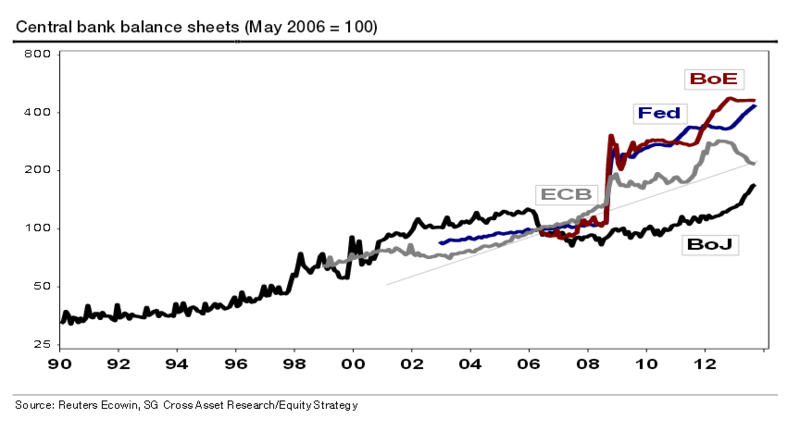 Much depends on the rate of deterioration of all the assets on the Fed balance sheet excluding T bills. The markets know exactly how to value T bonds so taking them off sick banks books for cash doesn’t change opinions about the banks health, so the Fed must buy impaired assets as if they were money good. This strengthens the selling banks balance sheet but weakens the Fed’s. Already against the zero bound on rates, the Fed must now buy ever more, ever junkier financial assets. I suppose this can go on until the Fed owns almost everything and then has a fire sale to the same bankers that it bailed out. They in turn sell the residual collateral underlying same for cents on the dollar. Thus arrives the Minsky moment debt deflation driven asset price decline we fear but very quickly and without destroying the financial system. This is what happened in the Savings and Loan disaster writ large and it kind of worked out ok then. That’s quite possible. As for the rest, you have been getting incorrect information about the Fed and its operations. The Fed’s H.4.1 report gives the composition of the Fed’s balance sheet. It is almost all Treasuries and government-guaranteed mortgage-backed securities (mbs). The Fed is a government agency (seperate from the privately-owned regional Fed banks). It’s balance sheet is irrelevant. We could consolidate it into the Treasury and $2.1 trillion in government debt would be eliminated. Nope. The Fed is buying only Treasuries and government-guaranteed mbs. The buying of dubious debt was in 2008-2009 (see this graph). Just as you say, the Fed has not yet begun buying impaired collateral that Treasury is not already on the hook for through government guarantees. But the difference is subtle because Fed purchases of non guaranteed securities also transmit to treasury as do profits. Thus it really matters how things work out path forward for realized losses on the non T-Bill components of the Fed balance sheet. T-Bills can be held to maturity without any realized loss so I exclude them. The Ponzi status described by Minsky is something that happens throughout a sagging economy. Actors who easily covered cash outflows from healthy inflows from assets in good times make up shortfalls by selling assets in bad times. Those already selling assets like house flippers and stock flippers in the good times find selling assets can’t meet their cash obligations in bad times so they must borrow against their assets as collateral. These are the Ponzi actors and the Fed is lender of last resort. In ordinary downturns the Fed can refuse to lend and Ponzi’s are bankrupted and absorbed by healthy actors. The problem all the central banks have now is the number and size of the current Ponzi’s is enough to destroy the status quo financial system so they must lend even against their better judgement to preserve the system itself. The problem is Ponzi entities do not fix themselves if you lend to them. They keep being Ponzi’s and use the loans to meet cash flows. Without bankruptcy and absorption by healthy agents the economy will continue to falter. The Fed could stretch out the process in time but it cannot stop the process as it seems to be trying now. A smart Fed would allow some bankruptcy to clear the system at a controlled rate it could handle but that is very tricky even if they tried. I therefore conclude that the default path forward will be zero bankruptcy enabled by zero interest loans to the TBTF banks and by supporting asset prices so that current asset flippers don’t progress to becoming Ponzi’s. followed at some point by a fast and brutally painful Minsky reset with many assets being written of in a non-bankruptcy mediated fashion modeled on the Resolution Trust of the S&L disaster. The Fed is not now buying non-govt guaranteed securities (including Agencies under Federal conservatorship as guaranteed). I have no idea what you mean by “transmit to treasury as do profits”. Transmit what? To treasury what? Transmit how? To whose profits? Still, bottom line the Fed can indeed consolidate its balance sheet and it can even run at a loss lending itself printed money as needed. Embarrassing if Treasury refuses to issue debt to cover the loss once significant capital losses are realized but not illegal and largely irrelevant. Bullet proof or AAA actors. Slightly distressed or Aaa actors. Seriously impaired or Baa actors. In good times AAA’s pay cash out of earnings. Aaa’s pay cash from sales of underperforming assets. Baa’s pay cash by selling their Crown Jewels. Ponzi operators who pay cash owed to investors from funds received from new victims who are in fact unsecured creditors to the Ponzi are just criminals who do not admit they are borrowing investor funds to make their numbers. Of these there are very few. In hard times AAA’s turn into Aaa’s and Aaa’s become Baa’s and Baa’s inadvertently become Ponzi’s who pay cash by borrowing against their assets as a last resort not because they are criminals though this distinction is not always shared by regulators or bankruptcy courts. Central banks world wide seem to have decided to buy time by lending to these Ponzi actors at very low rates. If the Ponzi’s are banks CB’s help repair their balance sheets by lending short at zero rates and telling treasury to borrow long(er) at non zero rates. Banks symmetrically borrow short and lend long thus profiting. CB’s are helping repair Baa balance sheets by supporting asset prices by the same ZIRP policy by P/E multiple expansion in equilibrium with rates. This stops the creation of more Ponzi’s due to asset price declines allowing Baa’s to continue to meet cash obligations by selling assets. My point is buying time will not induce the restructuring of our status quo systems we need desperately. Only bankruptcy, one by one or “something equivalent but wholesale”, will do this. It looks to me that some kind of global wholesale liquidation and restructuring of many large systems is being chosen by default because piece meal bankruptcy is simply not going to handle the load when the Minsky moment arrives. (1) Your comments appear to be just making stuff up. Please provide data to support your assertions. Nothing on the Fed balance sheet is likely to generate substantial losses if held to maturity. You have this unwarranted idea that agency mbs have large risks. (3) There has been substantial deleveraging of the private sector, esp households, since the peak in aprox 2007. Also, since both HH and corporate income has increased, credit metrics have improved quite a bit. You have shown no data showing that we are in the late stages of a Minsky cylcle. 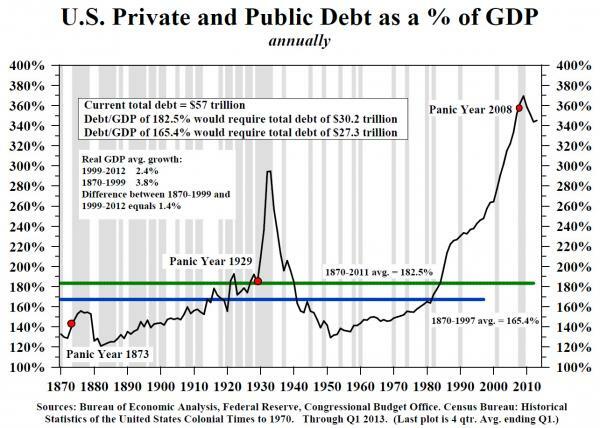 (4) The massive debt growth since the crash has been in government debt, which does not have Minsky cycles. Aggregate demand = GDP plus the change in debt. Aggregate demand = current income plus the change in private borrowed funds. Because GDP is also income and people generally spend the money they borrow. Even Krugman admits that the above relation may be true to the extent lenders are patient i.e. not likely to spend (it) soon if they don’t lend (it) and borrowers are impatient or likely to spend borrowed funds sooner than lenders would have. The rate of change of AD= rate of change of GDP plus the acceleration (second derivative) in private borrowing (debt). Government borrowing is part of GDP if they spend it and they do. Unemployment scales on the rate of change in (or slope of) AD. If AD doubles in a short amount of time unemployment will plummet. If AD stays constant (zero slope) unemployment will stay constant too. To decrease unemployment with constant GDP growth total private sector debt must accelerate meaning the plot of private debt vs time must curl upward. This plot however has likely stopped curling upward as of 2008. In fact in 2008 it curled downward (decelerated) badly and unemployment exploded. Minsky cycles end in debt deflation and Depression when debt fails to continue accelerating, not when it simply stops growing. Indeed private sector debt can have a positive time slope but a negative acceleration and/or a negative time slope (deleveraging) but a positive acceleration and if you look at a plot of private debt vs time the downward curving, though still upward sloping parts correlate well to recessions. It’s not possible to go from leveraging to deleveraging without a deceleration and it’s this transition that kills you not the slopes before and after. It is too soon to tell whether private debt is accelerating here and now, but if student loans taper (or just fail to accelerate) or corporate borrowing does or home mortgage lending does or all three do then it’s hello Minsky time. I’d love to take credit for making this up but I’m afraid this is classic Steve Keen who acknowledges he is not the originator either. I don’t understand the point of your lesson in Econ 101. You made assertions about the stage of the Minsky cycle the US is in now. That was my question. If anyone wants a lesson in Econ 101, they can go to Wikipedia or one of the many online college resources. Nobody sensible gets this kind of info from someone writing in comments, as they have no idea if you know what your writing about. Sorry FM but read again. Debt and its time derivatives controlling aggregate demand is not old hat. It is antithetical to most Econ 101 texts I know of. Debt acceleration controlling unemployment and correlating with unemployment is extremely new even from Keen. Did you read my comment? You are making that up. Debt is powerful tool in capitalist economies, and has been for millennia. Paul Krugman would have very little basis for a conversation with Richard Koo. Krugman would say debt cannot matter to macro economic outcomes because for every debtor there must be a lender so debt simply moves money from one pocket to another. One man’s weak balance sheet is another’s strong balance sheet and in aggregate a “balance sheet recession ” is an oxymoron. So Richard Koo appreciates debt as a driver but neo-classical economists like PK do not and they out number the Richard Koo’s by 100 to 1. You seem comfortable with both views on this board. Or have you not considered that this is true? It appears to me that you are just making stuff up. Can you provides specific citations to support your assertions in this comment? That is false (it is also silly). Krugman has made numerous references to Koo, even in his general-audience blog. They have many points of agreement and disagreement concerning the great economic issues of the day. There’s a lot to like in Koo’s idea of balance-sheet recessions — how an overhang of corporate debt held down Japan’s economy, how an overhang of household debt is doing the same to America. And Koo is unique — which is a good thing — in arguing both that protracted deficits are sometimes desirable, and that Japan is actually a success story in the sense that its deficits made it possible to repair corporate balance sheets without a Great-Depression-level slump. I do have a beef with his book, however. Koo makes a good case for the important of balance sheets, and the usefulness of fiscal policy. But he goes on the warpath, not just against the idea that monetary policy can do it all, but against the idea that it can do any good whatsoever. And I think that’s wrong. (2) Where do they disagree? 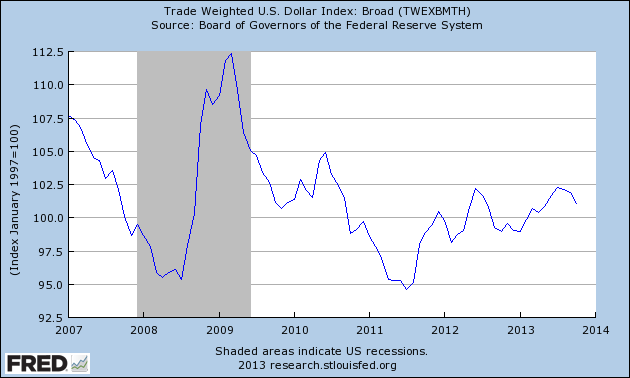 2011: Will a moderately weaker US dollar hurt the US? Krugman says no; Koo says yes. I agree with Krugman. 2011: Will monetary policy help in a balance sheet recession (now, after the crisis)? Krugman says yes; Koo says no. Evidence so far suggests each round has less effect. 2013: Will inflation help Japan? Krugman says yes. Koo says no. So far Koo is right, although it is too soon to draw firm conclusions. This is quite fair and accurate but ignores the real difference between PK and Koo. One believes in endogenous money creation by banks and one does not. Here are some links to Steve Keen opining on the relevant topics. I hope you find time to read them. I am amazed at your reaction to decisive disproof of your assertions about Koo and Krugman. This shows that you do not understand their debate, and suggests that you have little interest in learning. Citing Steve Keen — a maverick in the economics debate (that doesn’t mean he’s wrong) — to explain Koo and Krugman is at best an eccentric reply. Since you understand neither Koo nor Krugman, citing a source you rely on is not IMO exciting. I’ll take that as a “no” you’re not going to read them. Krugman allows that at the zero lower bound it may be possible for Koo to be right because the market rate at which normal equilibrium and thus loanable funds would apply is a negative interest rate. Koo is less clear on how much he agrees with this. Away from the ZLB Krugman still argues that a balance sheet recession is impossible. I find this remarkably obtuse. I have never seen Krugman indicate he has read or understood anything that Keen (and Minsky and Schumpeter ) have been saying. Ok, I’m begging you FM. Read the second link. It’s well written and succinct. Hopefully it’ll be a revelation. That you refuse to acknowledge your lack of understanding about these things, despite decisive disproof of your previous statements, shows a reluctance to learn that I find quite sad. That you think a reference is compelling after showing your incomprehension — that’s also sad. I read both Krugman and Koo. My guess (emphasis on guess) is that your false ideas come from reading (or misreading, perhaps) Keen. It’s true that I have difficulty paraphrasing guys like PK because frankly much of what they are saying is, to me, utter nonsense. Krugman is a static equilibrium guy by admission but he repeatedly ventures to apply his analysis away from equilibrium thus making statements about the system evolution away from equilibrium. This is a very big no no in my my branch of physics and it is so corrupt I have difficulty understanding what he is saying. He is too far off my reservation to be comprehensible. I guess that’s just another way of saying I really disagree with his approach. If the model has no time variables and cannot be differentiated any discussion of how the system moves from one equilibrium state to another is a non starter for me. Literally FUBAR. I will never “get it”. It takes great self-esteem to say that about a Nobel-prize winning economist. Let me correctly restate your sentence: You have difficulty paraphrasing the work of top economists because you are ignorant about the basics of economics, and have no interest in learning. I am moderating your future comments. Posting quotes or citations are welcomed. The MBS on the Fed’s balance sheet is Agency-guaranteed but not explicitly Fed government guaranteed. We can argue about the real distinction between implicit/explicit on this guarantee, but the Chinese in particular have voted with their pocketbook. Per TIC data, the Chinese were major holders of Agency MBS prior to 2008 (supposedly the Fed and US government lobbied the Chinese post 2000 to plow reserves into MBS over T’s). Since 2008, the Chinese have rotated out of MBS and into the short-end of the T-Bill/Treasury curve. One of the features of the Fed’s financial experiment has been the “qualitative” easing to go along with the quantitative easing. Prior to 2008, the Fed’s balance sheet featured a much, much higher percentage of short-term USTs in its overall holdings. Now the Fed owns major chunks of the extended yield curve. The Fed is no longer positioned closest to the exits. Certainly the mix of the Fed’s balance sheet is improved since the days of Maiden Lane I/II/III, but it is just as certain that the mix is deteriorated compared to pre-2008. It is easy to say there is no quality difference between short-term Ts, long-term Ts, and MBS — until there is. I do not understand your point. (correction, this was wrong: Your) Peter’s statements were materially incorrect, as I showed — and provided evidence for. You must be kidding. The strength of the imputed Federal backing for Fannie and Freddy was a question in early 2008. The government did in fact bail them out. To consider this an open question now is IMO quite odd. Furthermore, the GSEs are far stronger today than they were when the government bailed them out. Citing the Chinese government’s actions as an indicator of this is quite irrelevant. My apologies! I had replied to Peter B’s comment — you had not commented on this subject. My comment regarding MBS and China pertain to your comment. Yes — there was a bail-out of Fannie and Freddie. So has a precedent been set? Yes. Is there a statutory guarantee? No. Do foreign entities trust agency debt/MBS like they used to? No. The China comment is very relevant and can be extended to all foreign purchasers. Per TIC data, foreign holdings of US securities increased by ~30% across all classes from 2008 to 2012 (up to $13T+). Foreign holdings of agency debt/MBS dropped by ~40% (from over $1.6T to just over $1T, during a period when agency MBS grew from $4.9T to $5.6T per SIFMA). If GSEs are so strong now, why is it the asset class that foreigners are reducing? Fed is buying long-dated and MBS in no small part because the other major market participants have been decreasing (on either a relative or absolute basis) their purchases of these asset classes. By any measure the quality of the Fed’s balance sheet has declined relative to pre-2008 (again, I’m not saying it as bad as when Maiden Lane I/II/III were in play). This is not correct. The government buying you refer to was not as an investment, but to depress the value of nations’ currencies who were using mercantilist policies. Purchases of US government securities by foreign governmentshave decreased because these imbalances have decreased. Not because foreign governments’ opinion of a Treasuries has changed. Japan was running a massive trade surplus; now it runs a trade deficit. China still runs a large trade deficit, but has rebalanced thru a combination of inflation and currency appreciation (+12%in the past three years) so relies less on purchases of treasury securities. For a undervalued currency with slow appreciation, purchase of Treasuries was an us an almost certain loss — but that is not a significant factor. The Fed is buying securities under QE3 for more complex reasons than replacing foreign buyers. Also, the TIC data is a poor guide to measuring govt buying, Since many govts hide their purchases. I’m not disagreeing that China and others have engaged in mercantilism — this is not the point. The point is the qualitative change (for the worse) of the Fed’s balance sheet since ’08. Missing this story misses one of the major factors influencing how the Fed exits/tapers. The Fed has shifted to the long end of the curve compared to pre-2008. It has completely vacated the T-Bill market. This link has a good chart showing Fed % ownership by CUSIP (http://www.zerohedge.com/news/2013-05-23/moment-ben-bernanke-own-305-us-treasury-market-and-will-own-all-2018). Aside from the size of the Fed’s balance sheet, this mix is not at all normal. As for your TIC data comment… TIC data is accurate for total foreign holdings. The dynamic you refer to is one where foreign government purchases get hidden as foreign private purchases (usually London or Cayman Islands). That has nothing to do with the total reported foreign holdings, and these show the move away from agency/MBS. I have no idea whatyouread tempting to say. I replied to your specific statements, such as China selling agency be. Now you are saying a bunch of other stuff, with no obvious relationship to this thread. I assume you are joking. Who says current Fed actions are “normal”? That is why they call this “unconventional monetary policy”. By the way, the TIC holdings do not accurately reflect foreigners’ holdings. US investors, such as hedge funds, are often domiciled offshore for tax or regulatory reasons. At some points that is a significant factor in changes. Here is a better chart showing the Fed’s changing mix of Treasuries over the last 10+ years. If Fed wanted to raise interest rates (not saying they will anytime soon), how do they do that without any stock of T-Bills to sell? So you rely on ZeroHedge for your misinformation. As for how the a Fed will normalize rates, that has been explained a million times since this cycle started. Fed speeches, articles, economists’ blogs. It is not even difficult, and has been done by BoJ without difficulty. I suggested looking at the charts in the links to show my point of how the mix and therefore risk of the Fed’s balance sheet has changed — the sources are Goldman and Stone McCarthy. That the charts are on a ZeroHedge link makes no difference. Ignore the data if you wish. We have gone over this several times. You are replying neither to what I say or the data I show. Your delusion that I disagree with the data that I showed in my original reply is interesting, but not worth rebuttal. Neither Stone & Macarthy or Goldman agree with your odd theory that the Fed balance sheet has any significant risk of credit losses. There is interest rate exposure on the Fed’s portfolio, which might produce realized losses when — or perhaps if — the Fed sells its longer duration securities. But since the Fed is a govt agency, that is not a significant macroeconomic factor. That you hold so many misconceptions was the source of my suspicion that you get information from zero hedge. My personal belief is that once the true value production components (manufacturing first) are destroyed, an economy is destined to a slow and agonizing death. QE may have its use for restarting a healthy (but stalled) economy but cannot fix broken fundamentals, as it is the case right now. Actually I stand corrected. Currency devaluation caused by QE may help by making exports more competitive, but this has not been the case so far, not for the US and not for Europe either, especially with respect to China and India. That’s a common belief. It is totally without foundation. US manufacturing is doing quite well (albeit with fewer employees, due to new tech). Exports are a tangible sign of a nation’s ability to earn its way in the world economy. US exports have been increasing for generations, both in dollars and (as shown below) as a fraction of US GDP. Much of the discussion in the FM website’s comments about economics consists — as on this thread — of correcting misinformation people get from conservative media. The “Obama & Bernanke dollar devaluation” is a fav, but mythical. See the numbers. Note that the current value is 101 — with 1997 = 100. No change in 16 years. I think a better measurement for the relevance for manufacturing with respect to GDP. I was able to only find a dated chart at http://investing.curiouscatblog.net/2010/06/28/manufacturing-output-as-a-percent-of-gdp-by-country/ , but I think it is interesting that the countries with the highest manufacturing ratios are the ones which are doing best (China, Korea, Japan, German), vs. USA, Italy, France, etc. In terms of the devaluation, I am in complete agreement (and total amazement) with your assessment and I apologize for not being clearer. My personal read of the situation, about 2000, was that the Fed would be stuck between a rock and a hard place. They would not be able to raise rates to defend the dollar without thrashing the economy, and they would not be able to lower rates to stimulate the economy without thrashing the dollar. My best guess at the time was that the choice of lower rates would be taken for political reasons, which would end up in smoking the dollar. The only justification I can find for this not having happened so far is because of monetary warfare from China. Their purchases of US treasuries have had the effect of keeping the dollar up, thus not creating the expected devaluation but destroying our manufacturing competitiveness. In many ways I think that if China had carpet bombed our industries, they would not have been able to inflict as great a damage as they have done so far. Needless to say we have been willing accomplices in this dance. I am hoping that I am wrong and I would welcome someone to point out the errors in my ways. Japan “doing best”? Japan has been in a slump for almost a quarter-century, since the 1989 crash. They have remained stable only by running massive fiscal deficits, and now have a gross debt of unimaginable size. Growth rates developing nations like China and Korea cannot reasonably be compared to those of developed nations. Their GDPs per capita are $6 and $22 thousand vs USA’s $50 thousand. So your reasoning rests on Germany, which has in fact done well. But much of that comes from its role in the EU, to whom it exports much of its goods. The EU and US are of similar signs, which makes them logical comparisons. Think of Germany as equivalent of the West Coast: 66 million people vs 50 million, GDP of $3.2 trillion vs $2.7T. Is Germany “doing better” than the US West coast? Your comment implies that a strong currency is always best. That’s a typical assumption one gets from reading conservative media, and is totally without foundation. Is a higher body temperature always better? In the same way the value of a currency depends on many factors, but must be in equilibrium vs that nation’s condition vs its trading partners. More boradly, many nation seek to depress the value of their currency in order to increase their exports — the beggar-thy-neighbor tactic. It would not work if a weak currency was a bad thing. How to tell if your currency if over- or under-valued? Look at the trade balance. Deficits suggest that your exports are over-priced and imports too-cheap. That implies the US dollar is over-valued, no surprise since we’re the only nation that pays little attention to the value of our currency (in this, as in so many things we are exceptional — exceptionally stupid). For a more detailed explanation see this post written during the last bout of conservative anguish on the subject: The falling US dollar – bane or boon?, 14 October 2009. Casandra, I strongly recommend you change your sources of information. Try The Economist magazine, and Paul Krugman’s op-ed’s and blog posts. Please do not construe my statements to imply that I am supporting a strong dollar, to the contrary. 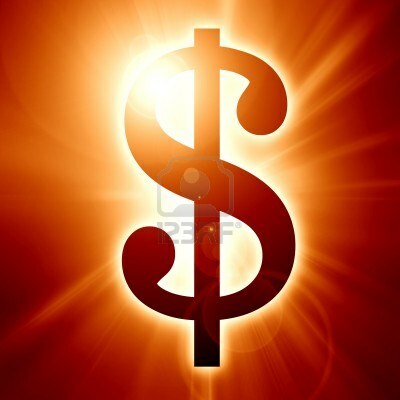 The point I was trying to make – and that you ended up in making for me far more eloquently – is that it is criminal to let the dollar remain over-valued, as it has real real consequences on the economy, and not realizing this is equivalent to letting a foreign power bomb our industrial base without even acknowledging that such bombing is taking place. I have been an avid reader of Paul Krugman, and the only beef I have with him is that I believe that a purely monetary stimulus without a fundamental rethinking of the economy e.g. real investment in infrastructure (physical (high speed trains, and renewable energy, not just a bunch of highway overpasses) and intellectual (education)), and without figuring out a strategy (and no, getting rid of government regulation is not the answer….) to reverse the off-shoring trend, will not achieve the desired results but just push out the date of reckoning. IOW if you do not have a vibrant engine of value creation, everything else (including tax and/or monetary policy) is a moot point. As much as I despise the right and the Tea Party (I think that their “solutions” are exactly what brought us in this mess in the first place, and doing more of the same is NOT the answer), I think that their focus on “job creators” is paradoxically the right one, even though they are drawing spectacularly wrong conclusions. As everybody has quite rightfully pointed out above, the current state of things cannot and will not go on forever. The fact that we are not taking the means that have been provided to make a true difference for us and for our children is why I decided to use the name cassandra. Thanks for the explanation, covering many of the views expressed here during the past five years. When the crash hit I (and others) recommended a three-fold response: monetary and fiscal stimulus plus deep reforms. We got lots of the first, a little of fiscal (and poorly designed), and no substantial reforms. No surprise that we got only a sluggish recovery, and that tilted to benefit the 1%.